There are some things in the world that are best in class. Habanos cigars are, without a doubt, one of those things. However, the first time I smoked a cigar was an awful experience. I was with more experienced smokers and decided to join them in the hopes of unveiling the secrets behind this mystical act that was still unknown to me, despite being Cuban myself. I was offered a Cohiba Siglo V, a strong flavor, to be marinated with a Havana Club 7 year aged rum. Smoking my first cigar was easier than I imagined: the flavor was pleasant on my palate and as I inhaled the smoke into my lungs I thought nothing of it other than “Hey, I just smoked my first Habano!” It all hit me once I stood up. I started to feel sick, and although I only had one drink of rum, I felt dizzy. I started walking and soon thought I would faint. I had to sit down for 15 minutes to recover before I could carry on. I wondered what happened? Had I done something wrong? I later found out that as an amateur in the cigar world, starting with a Cohiba Siglo V was like starting with a neat glass of spirits for your first drink, not for beginners. And I had inhaled, another rookie mistake, for cigars are never to be inhaled into the lungs, rather drawn onto the palate. As I learned more about the different blends, the history of the most famous brands, and the rituals associated with the pleasure of enjoying a cigar, I began to fall in love with Cuban cigars. The history of the cigar takes us back to 1492 when the American continent was being discovered. The Cuban natives regarded the tobacco leaf as a medicinal herb used as a narcotic, emetic, anti-parasitic and sedative. When the Spanish arrived on Cuban shores they found the natives lighting this strange new leaf called Cohiba. They took some back to Europe and the demand for Cuban tobacco skyrocketed. Since that moment, cigars have been a coveted and renowned Cuban product. Cuban tobacco farmers have never used specialized machinery. It’s all still done by hand, preserving the same knowledge and traditions acquired generations ago. 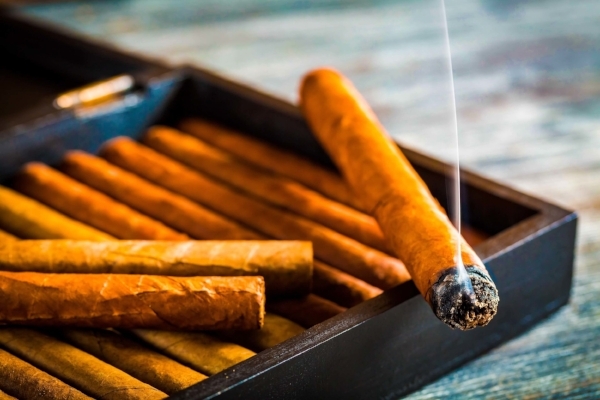 500 years of tobacco farming experience, along with the island’s unique climate regions and soil characteristics, make Cuban cigars the best cigars in the world. Habanos are the trademark of Cuban cigars, made with only Cuban black tobacco, a direct descendant of the same plants that Christopher Columbus discovered in Cuba five hundred years ago. Experienced smokers always look for the finest Habanos. This ensures you are smoking the finest wrapper and leaves, from the best crop, stemming from high quality seeds, grown in superior soil and tended to by an expert farmer. Tobacco farmers must care for their crop leaf by leaf. It’s not about the bounty of the crop, it’s about the quality of each leaf. Leaves are evaluated for their size, smell, consistency, texture and color. A good cigar takes its time. The whole process, from the preparation of the field until the last leaf is collected, takes 9 months. Afterwards, the aging process can take up to 2 years. As with a good wine, the longer the leaf is aged the better the quality of the cigar. The last step is in the hands of the tobacco roller who must employ expertise passed down by generations to arrive at the final product. Habanos come from this long process of care and devotion. And thus, smoking one is ritualistic by nature. It all begins with the selection process. Pay good attention to the color, its uniformity and shine. Small white or green spots are nothing to worry about. These are natural beauty marks that may occur due to the aging process. They in no way affect the quality of the cigar. You must first cut the cigar, before lighting. This is an important step. It must be done inline with the head of the cigar. Not too big, not too small, just enough to allow for the proper pull while avoiding the unraveling of the wrapper. Never cut with your teeth, nor pierce it with a toothpick or a match. Lighting a cigar takes time. You should always use an odorless flame, like wooden matches or a cedar sheet. Place the tip of the foot of the cigar at a 90-degree angle to the flame and turn it until it burns evenly. Once this occurs, place the cigar in your mouth and begin to draw slowly while keeping the flame a centimeter away from the tip. Smoking a cigar utilizes all five senses. One must discover and savor the varied hidden flavors. Indulging in the sensation of holding a cigar between your fingertips and placing it on your lips, while being mesmerized by the billowing smoke as it elevates, consuming you with its perfume, is like a meditation. And should be enjoyed with good company, conversation and a fine rum or whisky. Pair your Cuban cigar with a nice rum or whisky. Enjoy responsibly! The taste of a cigar is meant to be experienced on one’s palate, never inhaled. Only smoke ¾ of the size and never shake off the ashes. Wait to let them fall on their own. Lastly, at the end, don’t put out the flame by rubbing it. Simply let it rest in the ashtray, allowing it to die with dignity.